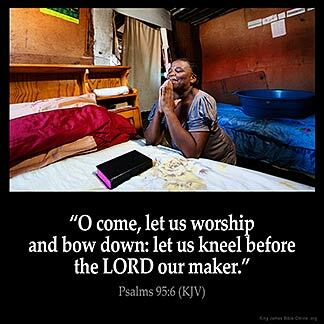 PSALMS 95:6 KJV "O come, let us worship and bow down: let us kneel before the LORD our maker." 3For the LORD is a great God, and a great King above all gods. 4In his hand are the deep places of the earth: the strength of the hills is his also. 5The sea is his, and he made it: and his hands formed the dry land. 6O come, let us worship and bow down: let us kneel before the LORD our maker. 7For he is our God; and we are the people of his pasture, and the sheep of his hand. To day if ye will hear his voice, 8Harden not your heart, as in the provocation, and as in the day of temptation in the wilderness: 9When your fathers tempted me, proved me, and saw my work. O come, let vs worship and bowe downe: let vs kneele before the Lord our maker. O come, let us give worship, falling down on our knees before the Lord our Maker. Come, let us worship and bow down; let us kneel before Jehovah our Maker. O come, let us worship and bow down: let us kneel before the LORD our maker. Come in, we bow ourselves, and we bend, We kneel before Jehovah our Maker. He is worthy of our adoration. Let us worship the Lord in the Beauty of Holiness. It is a Great pleasure to worship and bow down before my Lord and my God. For it is He alone that has made and fashioned me. Praise God !!! Praise God !!! !